God Bless Y’all, Every One! Thank goodness for photo evidence, because otherwise most of you wouldn’t believe me. Unless you were there to see it in person, it seems awfully far-fetched. My husband was on stage last weekend. He stood in front of an audience and did stuff. Yep. Over the past several weeks, people have said “I didn’t know Brice could sing!” and “I didn’t know Brice was into that kind of stuff!” Well, he didn’t either. “Can he sing?” Debi Ballas, legendary Director and mind behind The Augusta Players (HBIC, if you will), asked when she saw him. He had a beard, and she thought he’d look good in the show. I told her we sing together all the time, but he wouldn’t ever in a million years say, “Hey, I want to sing today!” She wanted to see him anyway. “Do you sing?” she asked my wide eyed husband. “Um, in the car,” he told her. “Will you sing for me?” Uh oh. And he did. I left to take the kids home, while he “auditioned.” Nearly an hour later, he called. “So, I guess I’m in A Christmas Carol.” Before I could hear any details, my sappy self cried happy tears. I love watching my kids in shows. Now I’d get to be a theater wife, too? “Not only am I in it, but apparently I have to sing alone. Like, by myself. I also say the first spoken words when the curtain goes up.” He might’ve used slightly more flavorful language. He would be A Beadle. We didn’t know either. It’s a constable of sorts. He helps enforce the collection of money. The shock wore off, and hours and hours and weeks and weeks of rehearsals brought us all to production week. We listened to a previous year’s recording dozens of times. We know every word. My husband walked out on stage in knickers and a large feather hat. He learned to apply eyeliner. On himself. He carved mutton chops out of his full winter beard. He understands that upstage seems like a backwards term and stage left isn’t really left. He also knows what it feels like to screw up and get yelled at. A lot. Most of all, he figured out that it’s a team effort. All hands on deck. This team comes together to put on a fantastic show for you, their people. They hold each other’s babies, sew countless buttons, alter and re-alter little girl’s dresses, meet in the alley for a quick pep talk, fix bad wigs, praise perfect notes, collectively roll eyes when the director yells HOLD yet another time, make do with missed entrances and broken props, answer late night texts, fluff wigs, share Doritos and candy, and make inappropriate noises during the most perfect toe touch. This team comes together to put on a fantastic show for you, their people. If you saw The Augusta Player’s production of A Christmas Carol this year, you know what I’m talking about. It was extra special. It’s a gorgeous show every year, but this one sparkled a little more. It doesn’t have anything to do with my three people being on that stage (though it helps!). It has everything to do with the incredible talent we have right here in Augusta. There will be more chances to support your local theater group. Westside Story is coming up in February, and Shrek! The Musical is in May. 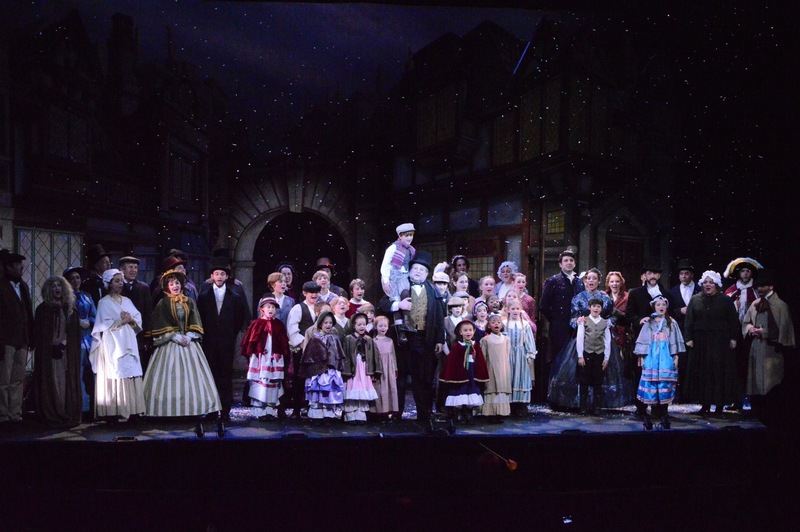 A Christmas Carol will be returning next year. The Beadle is considering it. If he’s game, I’m game. I’ll be in the wings cheering him on. Until then, we’re taking a well-deserved nap. Merry Christmas, and God bless y’all every one! ← Save the Date: you won’t want to miss it!